Pam Morley of Ælfgythe Women’s Border Morris dances through the past year’s activities. We have had a fantastic season which saw us enjoying a wide variety of events. Most memorable was our Wassail in February, when we were hosts to Alvechurch Community Choir, Banda Sem Nome Samba, Alvechurch Morris Men and of course the English Civil War Society represented by the amazing John Bright’s Regiment of Foote. The volleys they fired as part of the festivities were magnificent to see with the bright muzzle flashes in the dark. 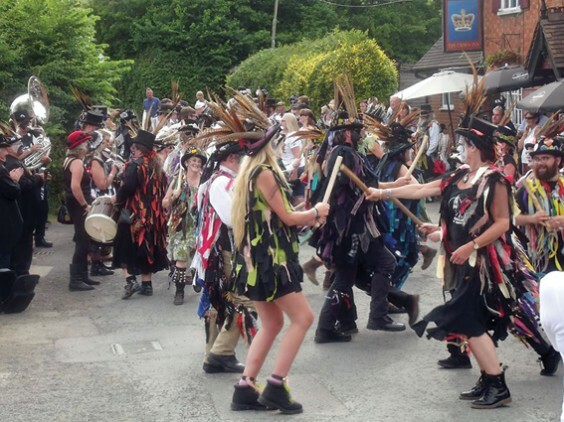 We danced in the village at local events such as The Weighbridge Beer Festival, and at events further afield such the Bromsgrove Festival and Upton Folk Festival. Then in June we hosted six Morris sides for our own Weekend of Dance to celebrate our 10th anniversary. The weekend took a lot of planning to make sure that everything worked well, and everyone in the side contributed to the organising to ensure that a good time was had by all! We had many compliments from all the sides who attended. The season ended when we were guests of Alvechurch Morris Men dancing at The Camp at Grimley, near Worcester What a splendid evening – thank you, guys. Now we are planning the new 2018 – 2019 season, with our first practice on Wednesday September 5 at Alvechurch Baptist Church Hall from 8–10pm. Our Wassail is in early February with all the usual components – and possibly some extras – and we are negotiating to stage a mini beer festival and day of dance in October. Other plans include a fashion show next year (more about that after Christmas) and of course we will be at the New Year’s Day celebrations at the Crown Inn, Withybed – as long as Alvechurch Morris Men invite us (if they don’t, we’ll just turn up anyway!). We have already been invited to dance out with a number of different sides, and to the Wassail at The Fleece Inn at Bretforton, near Evesham, in January – woolly vests time, I think! A further date not to be missed will be the Bloodstone Border Morris rally on the Isle of Wight next June to celebrate their 10th anniversary. We are recruiting new dancers and musicians for the coming season, and are putting on “taster” sessions for beginners every Wednesday in September. So, if you’ve ever thought about having a go at Morris dancing, this is your chance. We are looking for female dancers and male or female musicians. We are open to anyone regardless of experience, and really the only requirement is a sense of humour. We’re a really friendly bunch, and meet up for some exercise and most importantly fun. Why not come along?